You often wonder whether that issue you can't find was a figment of your imagination. You may even wake up in a cold sweat at the thought of hundreds of notifications landing in your inbox each morning. Octobox adds an extra "archived" state to each notification so you can mark it as "done". If anything happens on an archived thread, issue or PR, Octobox will move it back into your inbox. 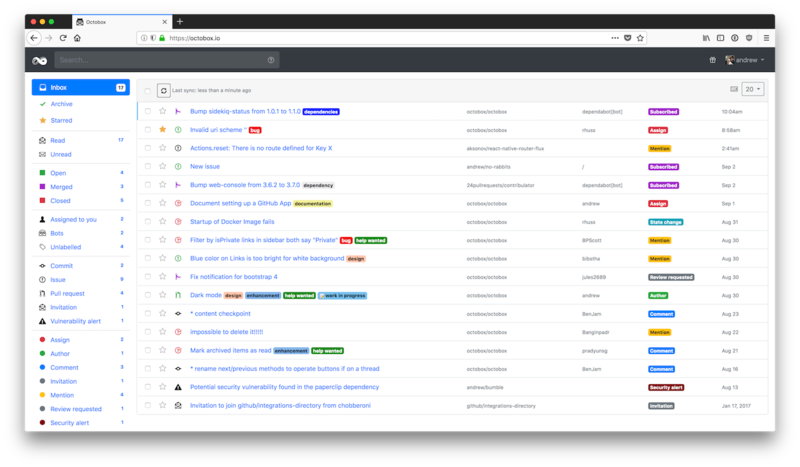 Search and filter notifications by repository, organisation, type, action, state, CI status and reason and keep notifications from bots alongside your regular labels, author and assignees. Pay by donation on Open Collective. Buy from the GitHub marketplace. Wondering why there are two options? Read more about our pricing strategy. The Octobox team hosts a shared instance of Octobox at octobox.io, but perhaps you're looking to host your own or get yourself set up to contribute to Octobox? Fantastic! There are a number of install options available to you, check out the installation guide. Octobox is open source and the source code is hosted at GitHub. If you have an idea for a feature or enhancement, open an issue or a pull request. If you want to contribute you'll find we're a welcoming bunch. If you don't know where to start, take a look at the issues tagged as "Help Wanted". You can also help triage issues. This can include reproducing bug reports, or asking for vital information such as version numbers or reproduction instructions. If you would like to start triaging issues, one easy way to get started is to subscribe to Octobox on CodeTriage. Finally, if you would like to become a maintainer, we will consider adding you if you contribute frequently to the project. Feel free to ask. More information is in our documentation.